I had guests over for dinner the other day and decided to make a dessert dedicated to both islands, Great Britain and Iceland. The outcome was Eton Mess with an Icelandic twist, using skyr. If you want to know more about skyr I wrote about it in an earlier blog post. Roast the almond and coconut flakes in a dry pan, until golden. Set aside to cool. Whip the cream lightly and fold in the skyr and blackcurrant juice. Add the crushed merengue and blueberries. Divide into four glasses or bowls. 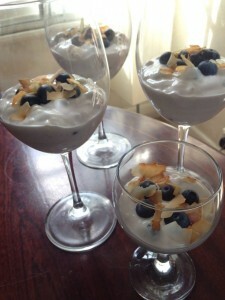 Decorate with almond flakes, coconut flakes and blueberries. 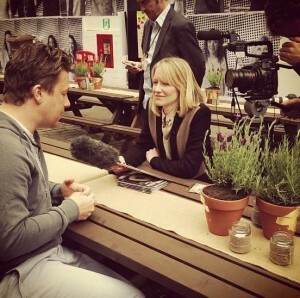 Today it’s Jamie Oliver’s annual Food Revolution Day. For years he has been educating people about food and encouraging everyone to bring fresh, wholesome foods to the table. Cook from scratch. For this year’s Food Revolution Day, Oliver has launched a global campaign and petition to urge school boards to make practical food education compulsory in their curriculum. He has even launched a song, where stars like Hugh Jackman and Paul McCartney perform. Here you can read all about his campaign and listen to the song. The photo is from Food Revolution Day 2013. 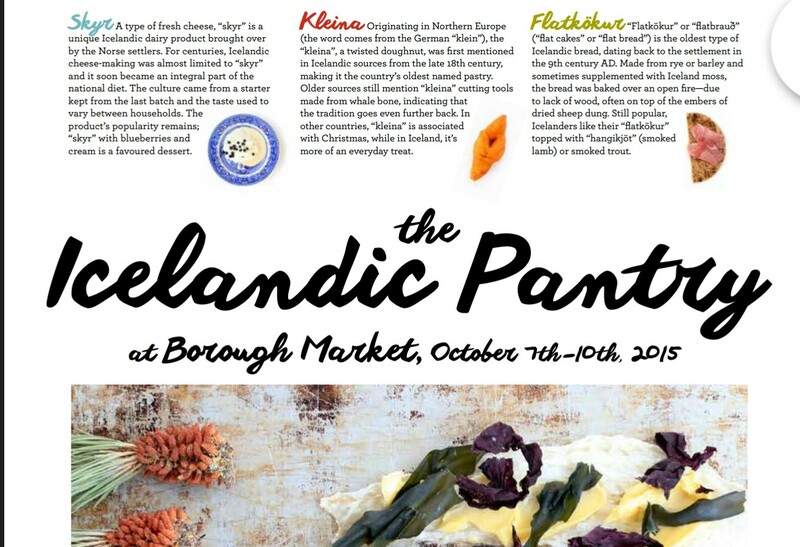 I wonder if Jamie Oliver has ever heard of the Icelandic super food skyr. It’s possible to buy skyr in the UK now, thanks to the Swedish-Danish company Arla. They call it Icelandic style yogurt and promote it like this; “High in protein, low in fat and reduced in sugar, Arla Skyr is made from all natural ingredients, making it a great way to give yourself a boost throughout the day.” Made in Germany. 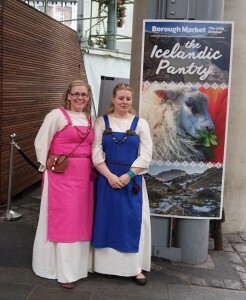 Many Icelanders haven’t been too happy about this. Here you can read about that. The skyr from Arla is not too bad in my opinion. It’s even better than some of the brands in Iceland, sold as skyr. Arla’s skyr is nothing like the “real” skyr though, the natural delicacy I grew up eating in Northern part of Iceland during the sixties and seventies. Skyr isn’t yogurt. Not originally. It’s actually a fresh acid-curd cheese made from skim milk. Read more about it here. I think Jamie Oliver would probably like skyr and he would definitely prefer the old, traditional kind.